The kingdom of Bahrain is home to many expats who live and work there. Not all can afford to buy properties, hence, the increased demand for affordable rentals in livable neighborhoods in Bahrain. 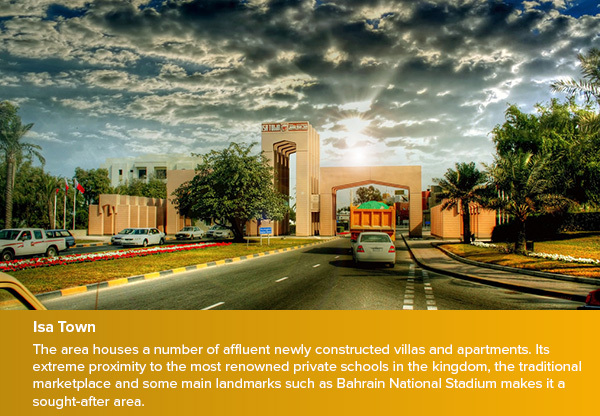 Luckily, there are plenty of neighborhoods in Bahrain that offer residents’ affordable and diverse housing options with various sizes that suit all tastes. 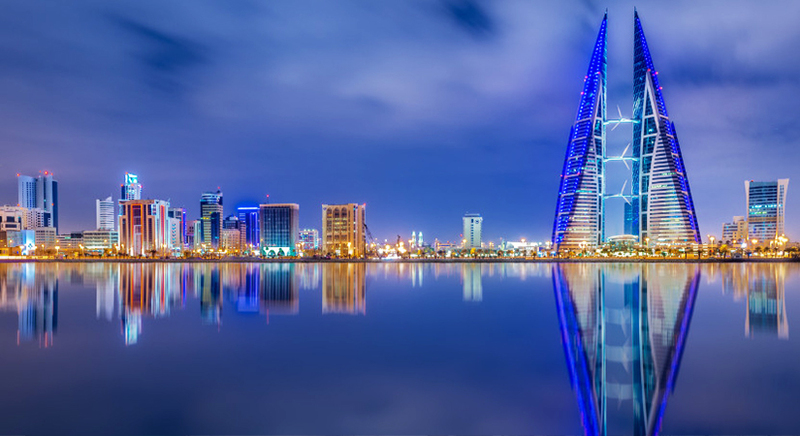 Here we give you the top five neighborhoods in Bahrain with affordable rentals and won’t break the bank. Located in the nnorth-centralpart of Bahrain, Isa Town is known as the middle class town in the kingdom. The area houses a number of affluent newly constructed villas and apartments. Its extreme proximity to the most renowned private schools in the kingdom, the traditional marketplace and some main landmarks such as Bahrain National Stadium makes it a sought-after area. Isa Town is an ideal destination for those looking for affordable rentals in an area that offers all sorts of services. The average monthly rent price for a one-bedroom apartment in Isa Town is between 180 BD, while a two-bedroom apartment rent ranges from 250-270 BD and that of a three-bedroom apartment is from 270-450 BD. As for villas, an average four-bedroom villa in a gated community is available for rent for 700 BD, whereas a five-bedroom villa is for rent for 1,500 BD per month. It’s central location makes it another favored neighborhood in Bahrain for those looking for affordable rentals. The Sheikh Khalifa Bin Salman Causeway Bridge connects the peninsular of Hidd with the mainland of Bahrain at the Mina Sulman port in Manama. The average monthly rental of a luxury two-bedroom apartment is between 300-400 BD, while the monthly rental of a three-bedroom apartment ranges from 400-500 BD. A modern three-bedroom villa rental is between 900-1100 BD and a five-bedroom villa rental is from 1300-1500 BD. Rentals in Al Janabiya won’t break the bank. The area is filled with plenty of affordable housing options that offer a quality lifestyle. For example, renting a furnished apartment of two bedrooms is between 500-650 BD, whereas that of three-bedroom villa ranges from 700 – 1100 BD. Al Janabiya is an ideal area for those looking to settle in a vibrant community that caters to their everyday needs and wants. 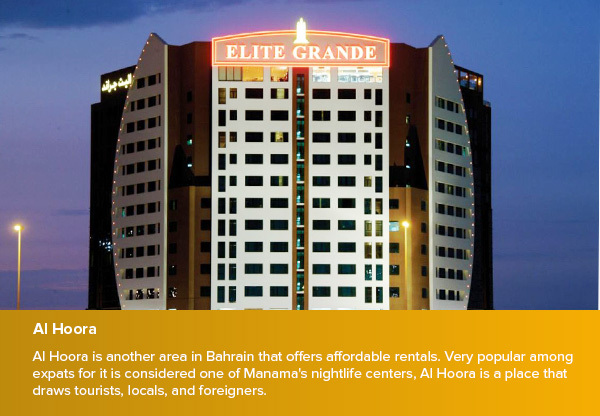 Al Hoora is another area in Bahrain that offers affordable rentals. Very popular among expats for it is considered one of Manama’s nightlife centers, Al Hoora is a place that draws tourists, locals, and foreigners. A modern two bedroom apartment monthly rent range from 300 – 600 BD depending on whether it is furnished or semi furnished, while a three-bedroom apartment rent ranges from 300 – 700 BD and this price range is also related to whether the property comes furnished or not. 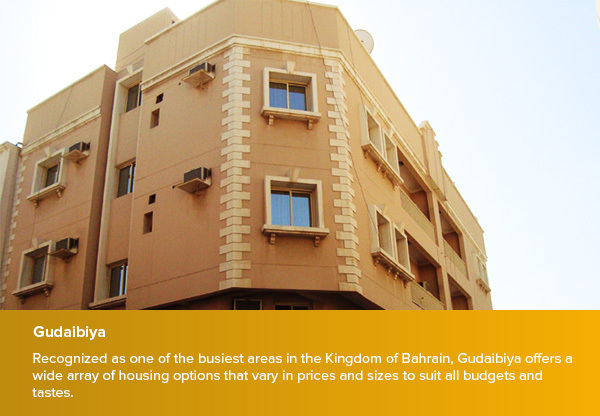 Recognized as one of the busiest areas in the Kingdom of Bahrain, Gudaibiya offers a wide array of housing options that vary in prices and sizes to suit all budgets and tastes. A beautifully furnished three-bedroom in Gudaibiya is for rent for 550 BD per month while renting a modern one-bedroom apartment is will cost you between 300-350 BD per month. Gudaibiya is a bustling and highly cosmopolitan area, home to many new arrivals in the Kingdom, all of which makes it the perfect destination for those looking to settle down in Bahrain.